New Sunderland striker Jermain Defoe says he welcomes the pressure of being brought in to score the goals to keep the Black Cats in the Premier League. 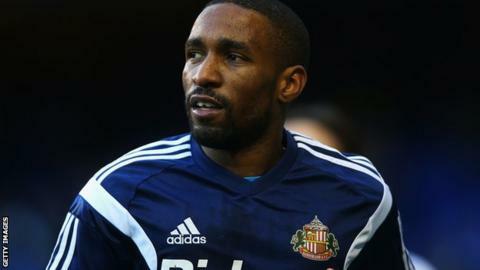 Defoe, 32, returned to England last week after an 11-month spell at Major League Soccer side Toronto. He scored a total of 124 Premier League goals for former clubs Tottenham, Portsmouth and West Ham. "It's a good pressure," said the former Tottenham striker. "It's another challenge and I am really looking forward to it." Defoe, who scored 11 goals in 16 games for Toronto, made his first appearance for Sunderland in Saturday's 2-1 defeat at Spurs, a game in which he failed to maintain his record of scoring on all his previous debuts. Sunderland are 16th in the Premier League, just one point above the relegation zone, and have the second worst scoring record in the league with only 19 goals in 22 games. "As a forward, you are judged on scoring goals and you want to come and make a difference and score goals to help the team move up in the table," added Defoe, whose highest top-flight return was 18 for Tottenham in the 2009-10 season. "That's what I'm here to do, and I'm looking forward to it." Defoe, capped 55 times by England, also hopes to do enough to earn an international recall, having not played for Roy Hodgson's side since November 2013. "I would like to represent my country again," he said. "To play for your country, it's based on merit, so if I am scoring goals, I would like to think that I would get an opportunity to do that again."